Along with my kitchen scrap garden, I'm growing a couple more herbs and some sunflowers (a red variety that I've never seen before!) from seeds in some indoor pots. I needed a quick way to tell them apart and I figured that washi tape would work perfectly for these little garden makers. If you don't have any washi tape on hand, masking tape would work just as well...just not quite as cute. It's so simple that I didn't even write any directions to go along with the following photos. If anything is confusing, by all means, let me know. Since these probably wouldn't hold up in an outside garden, you should be sure to check out Astrid's great outdoor garden markers. 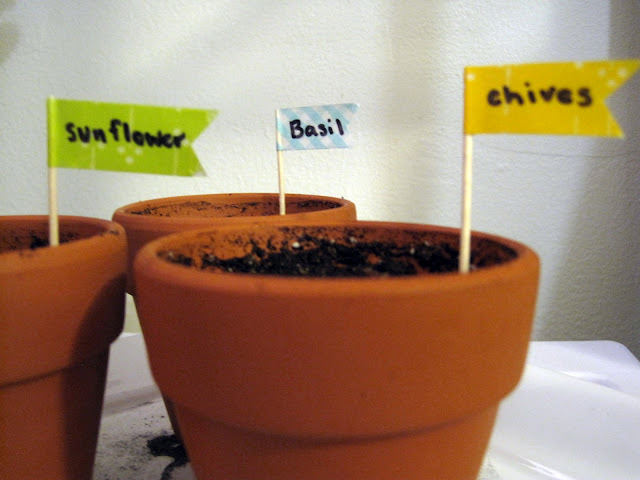 And these vintage spoons turned into garden markers are pretty creative! First and foremost, please excuse the ugly and messy state that my patio is currently in. We had a huge downpour of rain today and it has left some serious dirt, leaves, and the like spewed on our patio. Secondly, I wanted to share a few items that I've planted over the past couple months, most of which have been from my kitchen scraps. Here's a cute little potato that I had found sprouted in my produce bowl. 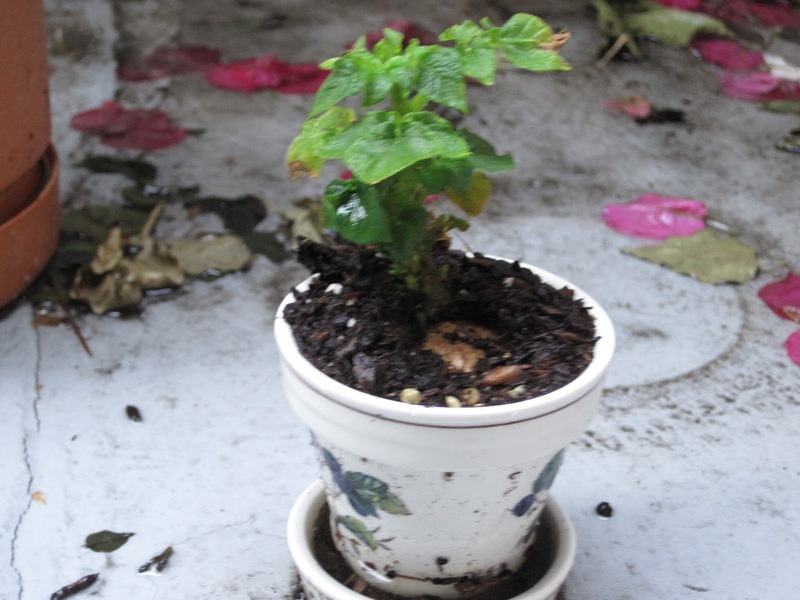 I cut off a section of the potato and planted it about 1.5 months ago. Now there is a lovely little leafy thing going on. Next up we have an onion (also found sprouted in the produce bowl) and a pineapple top. The onion appears to have gotten beaten down by the rain. I'm hoping that it doesn't die...yikes. But my favorite kitchen scrap plant by far is the pineapple. I mean, who knew you could even plant one?! Well, apparently a lot of people on the world wide web, but not me! 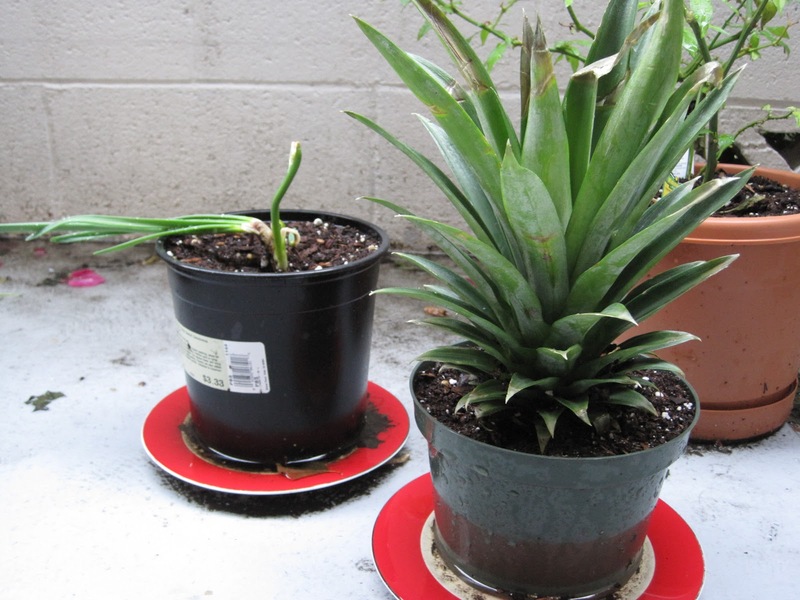 You just cut off the top with about 1-2 inches of the pineapple still on, then plant. That's it! 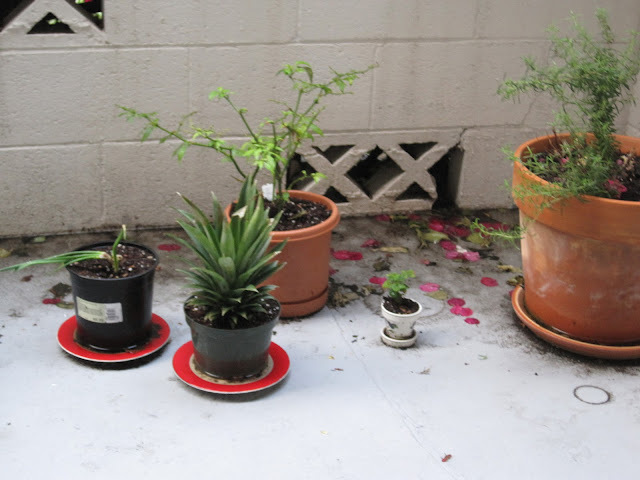 I will eventually have to replant in a larger pot as they supposedly get rather gigantic. And eventually it will even produce another pineapple! Today I started an avocado pit in my kitchen which I hope someday I have space to plant the tree. And next I want to try to plant a sweet potato - I hear they grow a lovely ivy. During a recent trip to Micheal's, my eye caught a new line of yarn: Vanna's Glamour. Apparantly Vanna White is now endorsing yarn. Naturally, I bought a skein in honor of my oldest sister who is obsessed loves Wheel of Fortune, or as she likes to call it - "the Wheel". The yarn is a yellowish-mustard color, for some reason it looks quite dark in the picture below. I wasn't sure what to knit at first, and I can't say I have an exact idea of what I'm making, but I'm fiddling around with what will perhaps turn into a cowl? I found a new stitch in a 1950's McCall's Knitting book called the "easy lace knit stitch" and am giving it go! 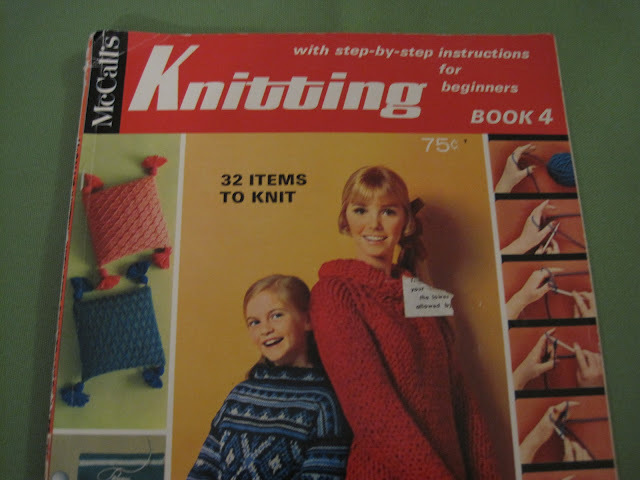 I acquired three of these fabulous McCalls Knitting magazine-books from the 50's from an older lady from my church back in Michigan about 10 years ago. She also gave me her stash of knitting needles (which quadrupled my then amount of knitting needles) and some yarn. 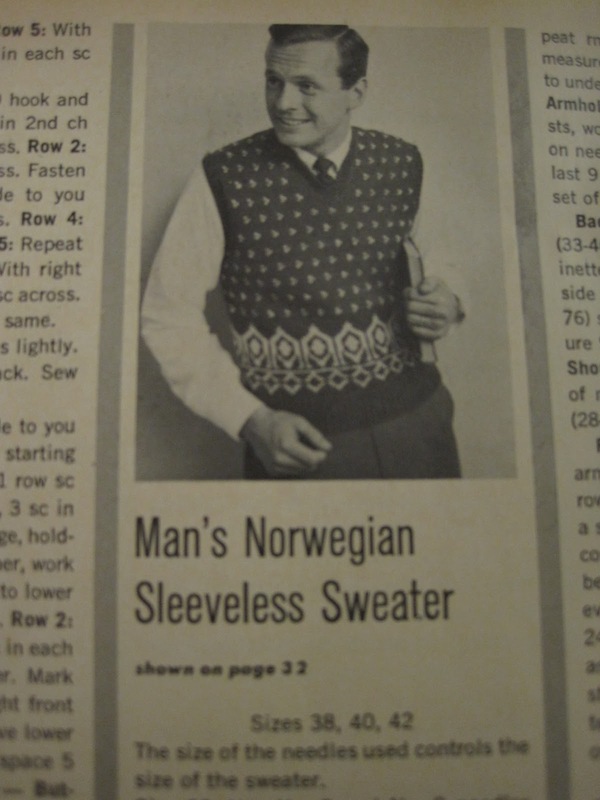 I guess you could say that's when my knitting obsession kicked in. 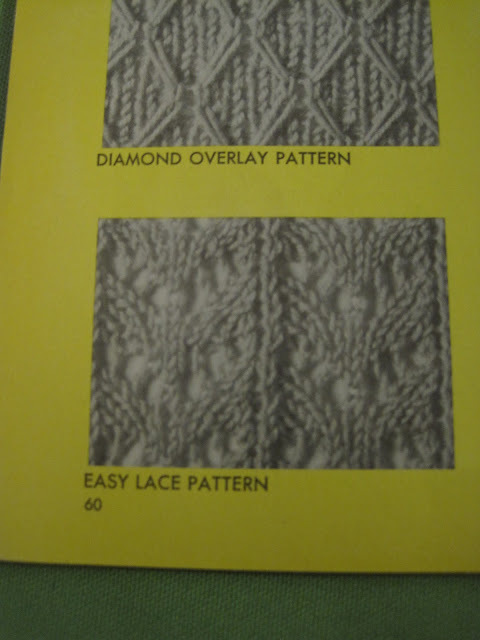 And below is the new stitch I'm trying out, easy lace pattern. 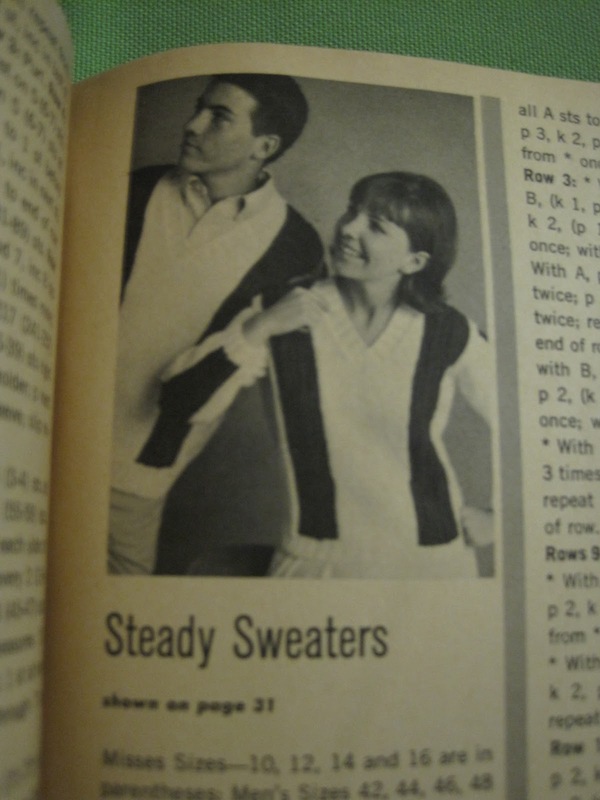 And there are tons of classic pictures and poses in this book. 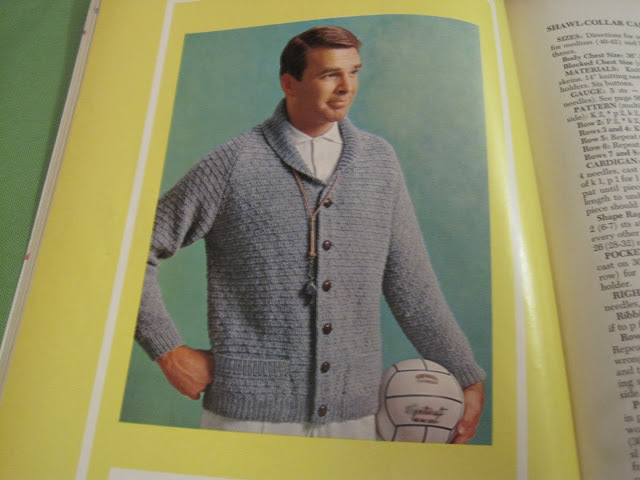 Remember when your soccer coach would wear a hand-knit cardigan? Yeah, me either. But apparently they did. And I'm seriously considering making these for me and Ryan. They're pretty spectacular. And they just look so happy wearing them. But the picture that takes the cake is definitely this squirelly-looking man. The poses that all of the models make in the book are priceless. But there's something about this guy that just cracks me up. I'm laughing at him right now actually. Ha. Here's to knitting up a storm! With Ryan being in school full-time, I often am left with an hour or two in the evening where he has to do homework or grade papers. 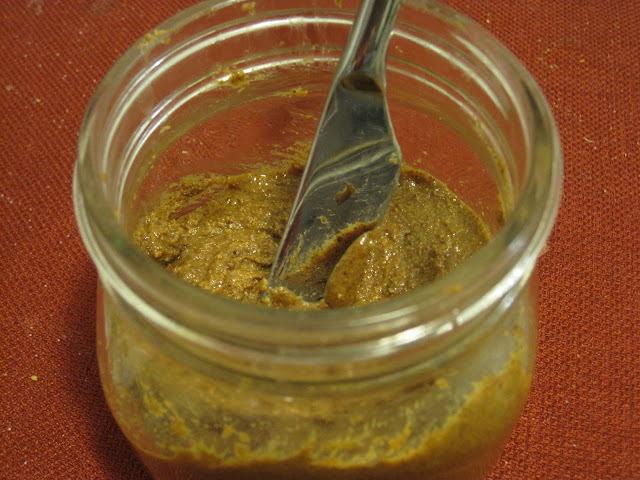 So last night I whipped up some spiced almond butter, I added cinnamon, nutmeg, cardamom, and ginger and it is goooood. I started by roasting them in molasses and honey. This made our apartment smell amazing. 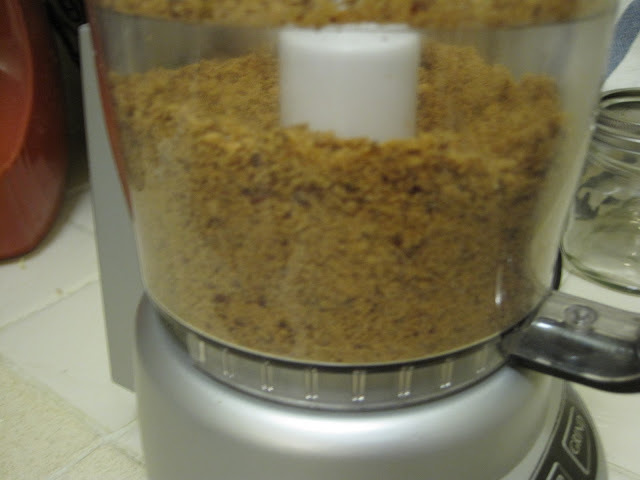 Then threw them in my food processor and gave 'em a good grinding. I only made a half a jar because I wanted to see if we would like the added spices to the nut butter. We definitely did and I will definitely be making this again! Preheat your oven to 300. 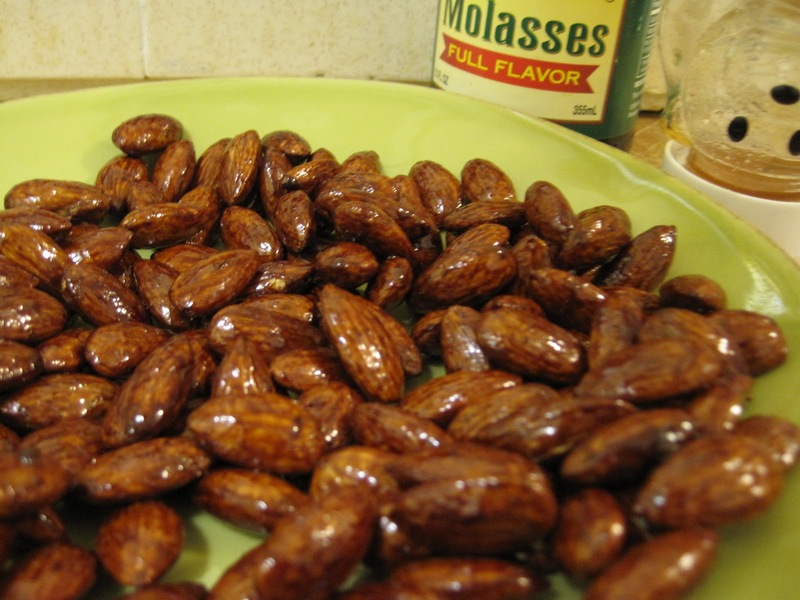 Mix the honey, molasses, and almonds together on a baking sheet. Coat thoroughly and lay almonds in a single layer on the baking sheet. Roast for 30 minutes, stirring and checking every 10 minutes. Remove from oven and cool for 30 minutes. 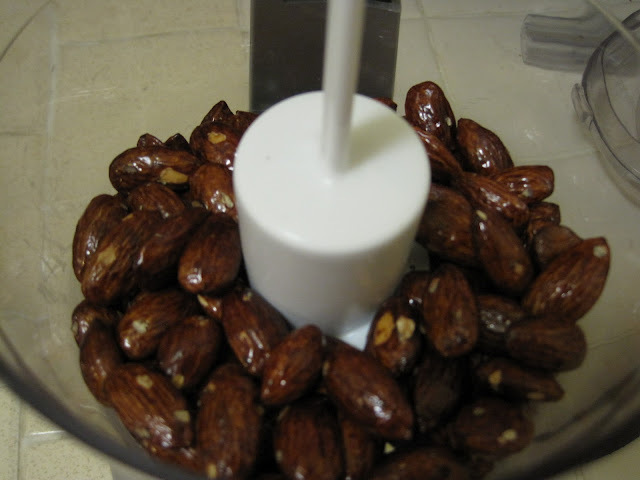 Put almonds into a food processor and begin to grind until a smooth butter is made. This took my mini prep about 5 minutes, maybe even less (I wasn't watching the clock). Once a smooth butter is formed, add an additional 1/2 tsp each honey and molasses, all spices, salt, and oil. Process for another few minutes until it returns to a smooth, butter consistency. Add additional oil if you like your nut butter very creamy. Spread on muffins, toast, apples, fingers, or anything you want! I like how you can fit a lot of photos on this board. Ryan and I still need to do something with all of our wedding photos so maybe something like this? And I love this idea. I think it would be neat to make 3: one from where Ryan and his family is from (Texas), one from where my family is from (Michigan), and one for where we live now (California). I also think it would look really neat to put it on an old piece of wood, or a piece of recycled wood. And last, but certainly not least, I love this gigantic knit blanket. Laura knit this on PVC pipe - crazy! She started knitting it on broomsticks before she realized even those weren't big enough, ha! Realistically, I don't think I have the time or PVC pipe to do this in the near future, but someday. I also have a few crafts laying around that are semi-completed. It's about time I pick them up again and finish them. Here's to a week of getting some craftiness going! 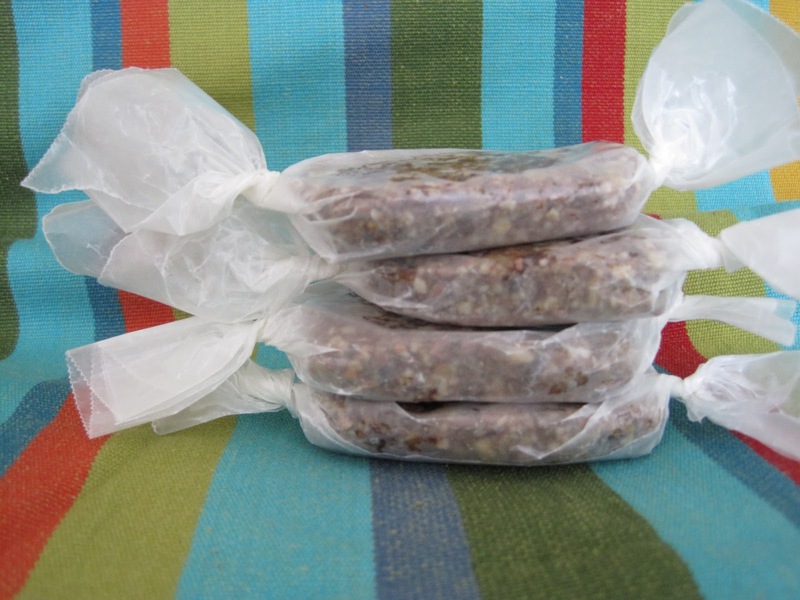 I know that I've mentioned my new Pinterest obsession already, and last week I ran into many recipes for homemade granola bars. What really caught my eye was a few recipes for homemade Lara Bars. If you haven't heard of a Lara Bar before, they are a healthy, gluten-free, snack bar made up of only dried fruits, nuts, and sometimes spices (like cinnamon). They can be kinda pricey at the store though (almost $2 per bar), so when I found this and this recipe I decided to go ahead and try 'em. After looking at a few different recipes, I decided to go with a very basic mix of dates, raisins, almonds, and flaxseed. A 4-ingredient, healthy wonder. These are full of fiber, protein, potassium (more than a banana's worth), and many B-vitamins. And each bar is just under 150 calories and fills you up. The perfect snack food, if you will. Be warned, you will need a food processor to make these. 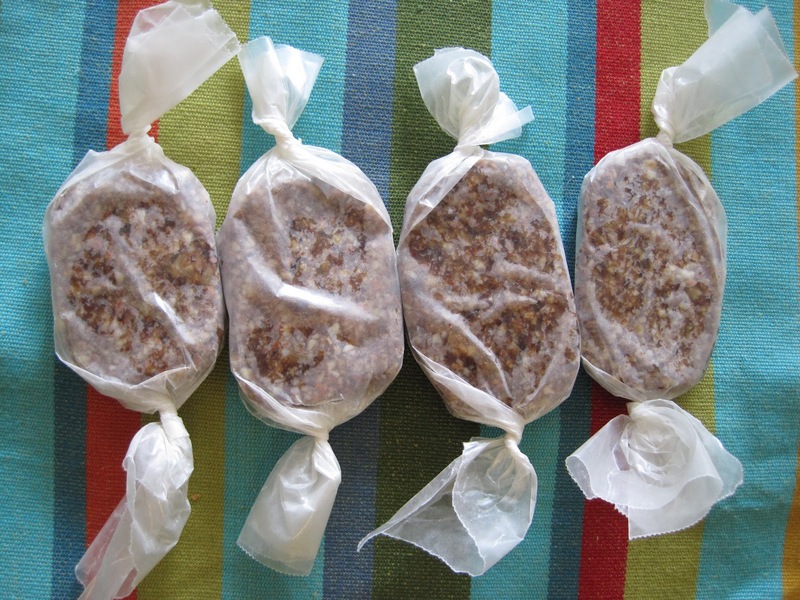 I only have a mini-prep processor and it worked fine, but I think they would maybe whip up a bit quicker in a standard size processor. First, prepare the wrapping for the bars. Cut 2 pieces of wax paper about 4 inches wide then cut those pieces in half. Set aside. Grind your nuts and flax in the processor until finely chopped. 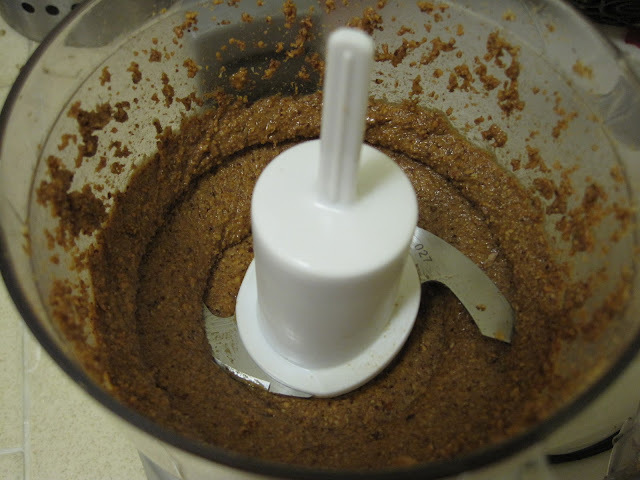 Put the dates and raisins into your food processor and process until well blended and as smooth as it will go. This took my processor a good 5-8 minutes. It becomes incredibly sticky and I had to stop frequently to push the mixture down with a spatula. Once fully processed, put the date/raisin mixture in a medium bowl. 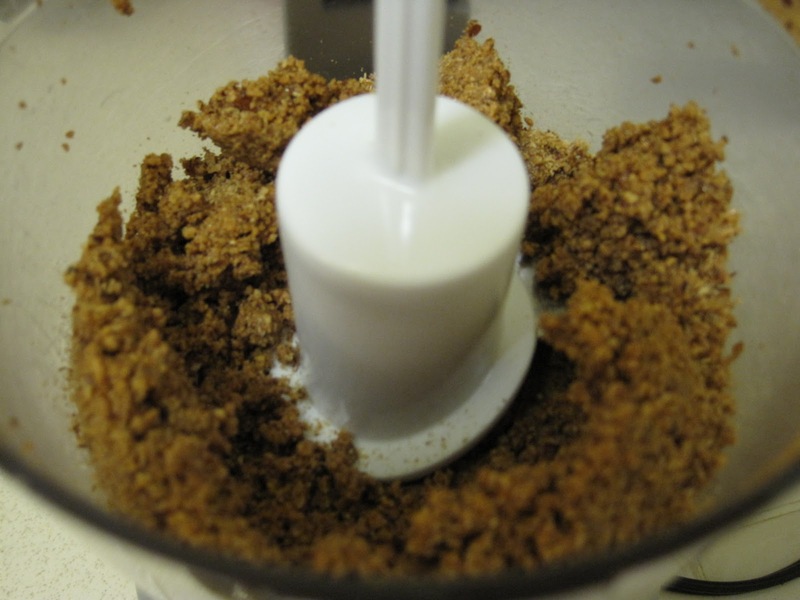 Add the ground nut/flaxseed to the bowl with the dates/raisins and mix thoroughly. I used my hands as I found trying to incorporate everything with a spatula wasn't working out so well. 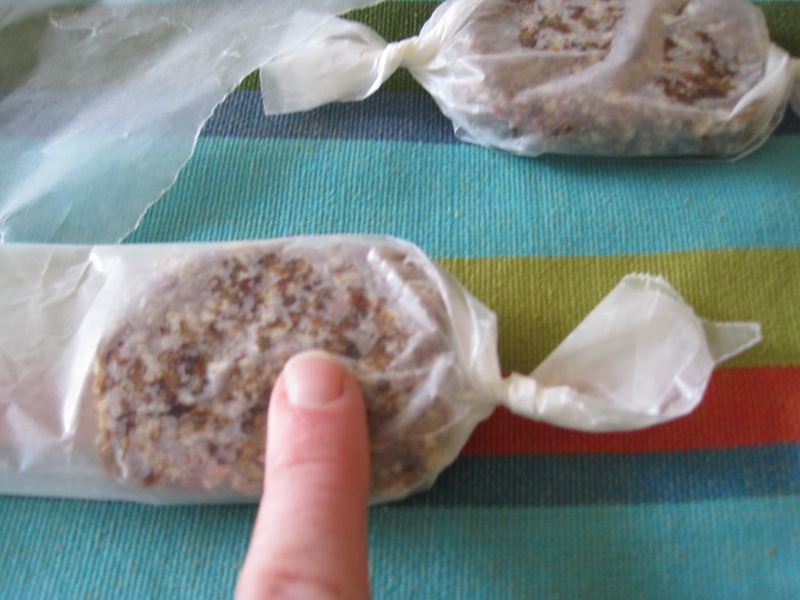 Separate into 4 equal parts, placing each part on a piece of prepared wax paper. If you'd like larger bars only separate the mixture into two parts. 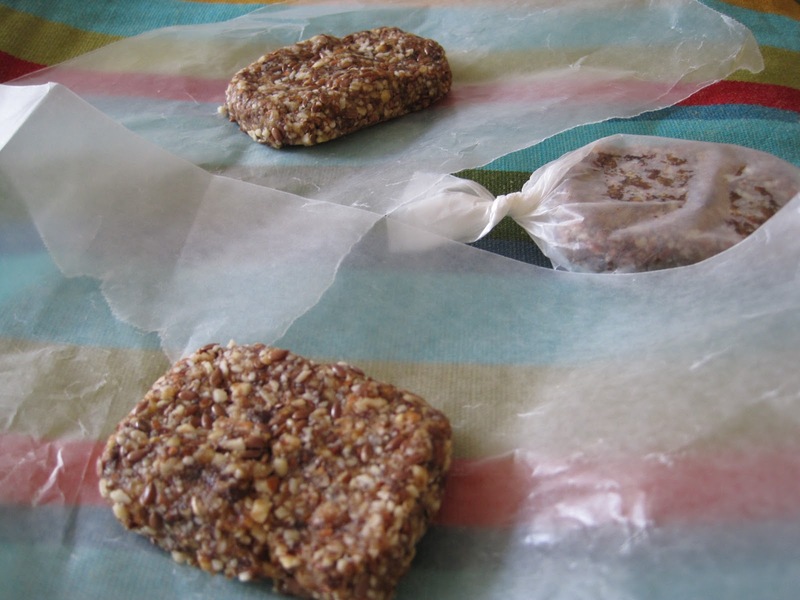 Using the wax paper, form into small rectangles. 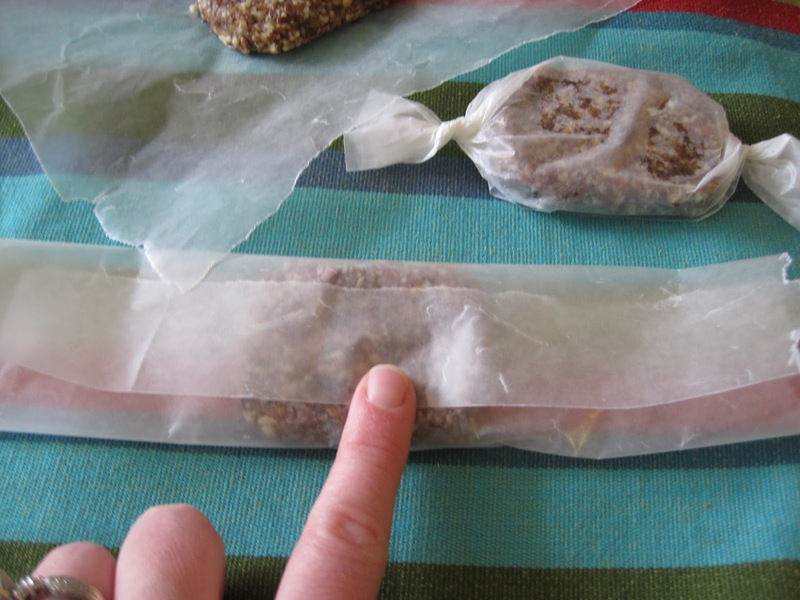 Fold the wax paper over the bars and twist each end. Refrigerate until you want to eat them up. I'm excited to have these around to snack on and throw in lunches! Update: I have made these a few more times and so far Ryan and my favorite fruit-nut combo is dried cherries with pecans - very tasty! Like every other person on the face of the earth, I love weekends. I love not having to wake up to the sound of an alarm clock. I love drinking copious amounts of coffee all day long (after 3 PM even - gasp!). I love having the time to bake, cook, and craft to my hearts content. This past weekend was no exception. My old roomie and good friend, Alisha, stopped by for lunch on Saturday and we feasted on some butternut squash soup, brussel sprout salad, and some Swedish rye bread. 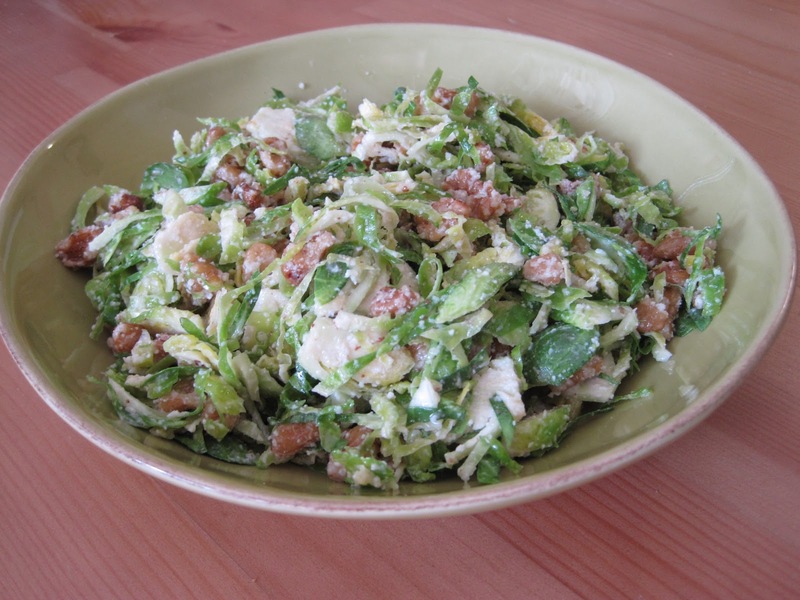 I have been seeing brussel sprout salads popping up all over the good ol' world wide web and thought it was about time I gave it a try. It was a success! Even Ryan (who detests brussel sprouts) ate this and liked it. 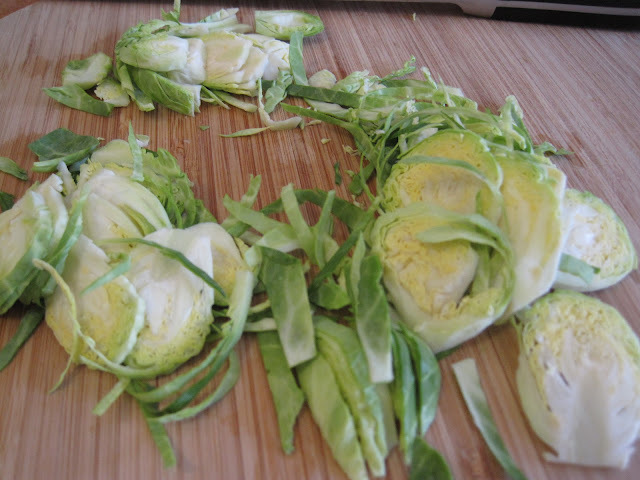 I think because the brussels are raw in this salad they don't taste as brussel-sprouty? Who knows. Who cares. It's good, trust Ryan the sprout hater. Add ingredients into a jar and shake until well combined. Pour over salad and mix well. Enjoy! 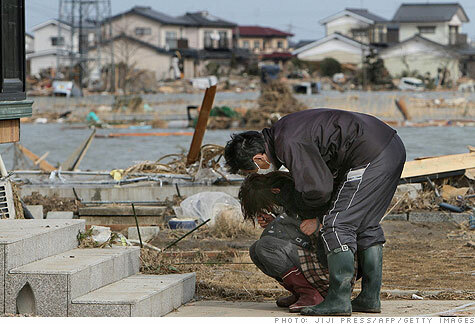 Today marks exactly one year since the earthquake and tsunami in Japan. It's crazy to think that it's already been an entire year since it happened. 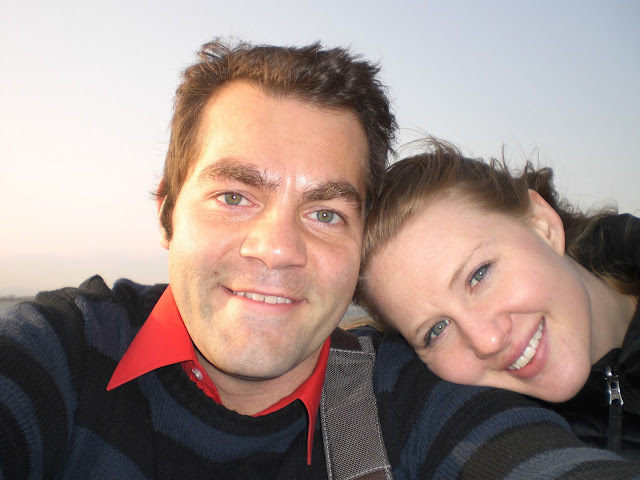 In case you didn't know, Ryan and I spent a little over a year teaching English in Japan. During the end of our school year was when the earthquake hit. I always meant to blog about Ryan's and my experience, but just never did. It's difficult for me to know how and what to write about it. So, I'm just going to recount our day. We were about an hour South of the epicenter and inland, so we had no tsunami effects in our area but still felt the huge earthquake. Thankfully, it was a day when both Ryan and I had a day off together (I seriously don't know what I would have done if I had been alone), and we decided to head north to spend our day shopping and sightseeing. After eating a lunch of gyoza, we headed to the mall. We had just walked through the glass doors when Ryan noticed that the ceiling lamps in the Starbucks were swaying back and forth. He paused and asked if there was an earthquake. Earthquakes are so common in Japan that no one really pays any attention to them. And that's what happened at first. People just kept doing what they were doing until the earthquake continued to build and didn't die down like usual. The ceiling lamps were crashing into each other by that point and things were starting to fall off of shelves in the stores. Then people started saying things in Japanese we didn't understand and started rushing out of the building. We figured they knew what they were doing so we followed them out to the street (I had always heard not to go outside during an earthquake...but panicked and figured it was what we should do in the moment). It was the eeriest feeling watching the buildings around us sway. 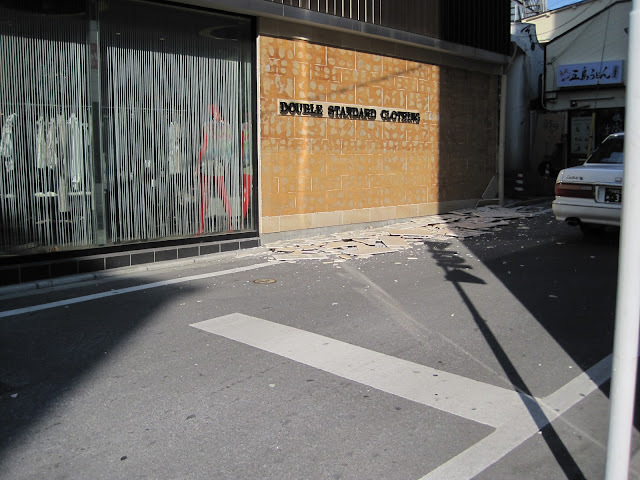 Tiles were falling off of the building and cars were stopped in the middle of the road. It felt like it lasted forever. When the shaking finally stopped we knew we had to get somewhere in the open (not surrounded by tall buildings) for the aftershocks. We made it to a parking lot for the first aftershock. After that, we headed to an open park where we waited out a few more aftershocks until we decided to try and head home. All public transit was non-operational so we ended up taking the longest and most expensive cab ride back to our apartments (I think it was almost $200 USD). It wasn't until the cab ride home that we saw (on the TV in the cab) images of the tsunami. The footage they showed was shocking, until that point we had just thought it was a huge earthquake. When we got back to our apartments, things were knocked over and we had no power. The rest of the day and night there were constant aftershocks. We heard about the Fukushima "meltdown" a couple days later. By then we had power back (we were very fortunate, many cities north of us remained without power for much much longer) and were able to check the news regularly. The remainder of our school classes were cancelled for the year (which was almost over anyway) and under the advisement of the US Embassy (and our families), we decided to go home a couple weeks ahead of schedule. As I'm sure you know, Japan is still in the process of recovering from this devastating event. It will take many years and constant help to continue the progress they've begun to make. If you can help, here is a link to many options for relief funding for Japan from the 2011 tsunami and earthquake. - He likes to drink old, cold, coffee leftover in the carafe. - I'm constantly surprised with the ingenuity he brings to household chores. For example, just last week I heard him yell out from the bedroom, "Look! I can make the bed while I'm still in it!" - Boys eat...a lot. I guess this is more a general thing I learned about the male gender, but it definitely still applies to Ryan. There are so many more but I'll stop it here and just say that I'm so thankful for this fellow. Here's to many more months and years of marriage! This was taken right after we got engaged in Japan in 2010. Ok, I know I just posted about muffins...but I'm doing it again. 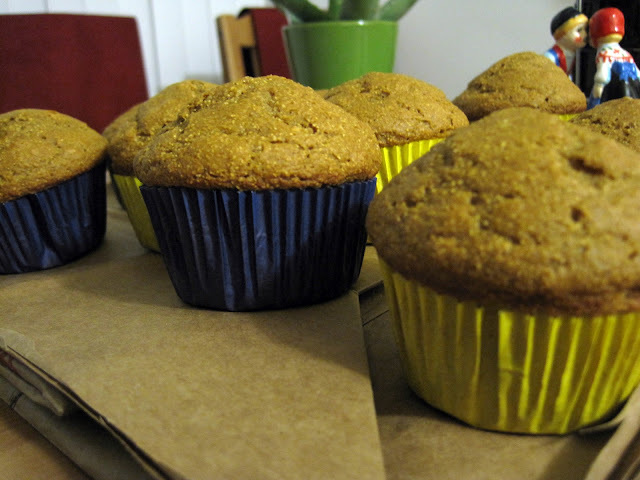 Tonight I made some corn and molasses muffins from Mollie Katzen's Enchanted Broccoli Forest cookbook. (sidebar: this is one of my all-time favorite cookbooks , also a huge fan of her Moosewood Cookbook. Both have amazing vegetarian/vegan recipes that are quite tasty). I used blue and yellow muffin liners - go Sweden! Preheat oven to 375. Mix all of the dry ingredients in a medium bowl. Make a well in the center. Mix the wet ingredients in a separate bowl. Pour the wet ingredients into the well and mix just until combined. Pour into 12 regular-sized muffin cups (I lined mine) and bake for 15-20 minutes or until a toothpick inserted in the center comes out clean. Cool 10 minutes before eating. This is my all-time favorite toothpick holder that my Grandma gave me a while back. She's always had one just like it in her kitchen. I think of her every time I use it - thanks Gram! Muffins are Ryan's and my go-to breakfast these days. Easy to eat, easy to transport, and tasty little suckers. Needless to say, I've been trying a plethora of new muffin recipes. 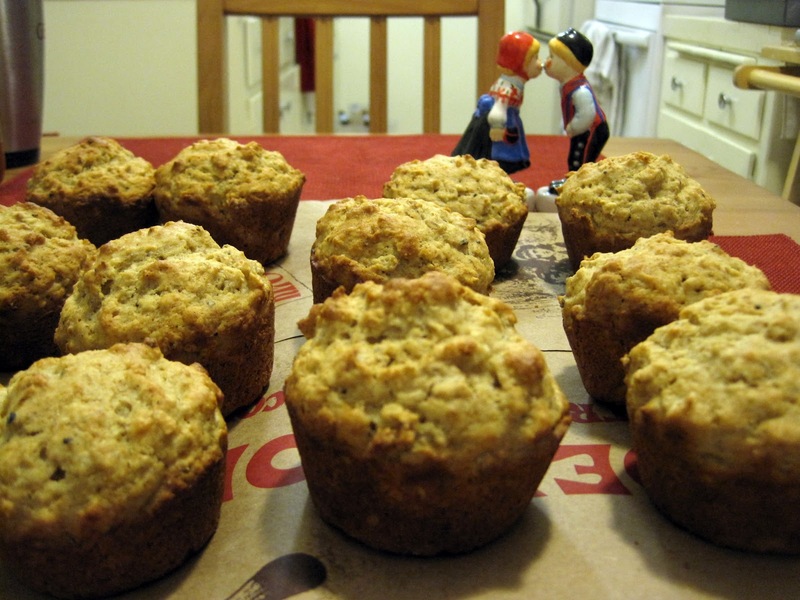 Last night I made these little guys: whole wheat cardamom oatmeal muffins. Healthy and scrumptious. I used this recipe, adding 1 teaspoon cardamom and substituting 3/4 whole wheat flour + 1/2 white flour for the original 1 - 1/4 cups flour. 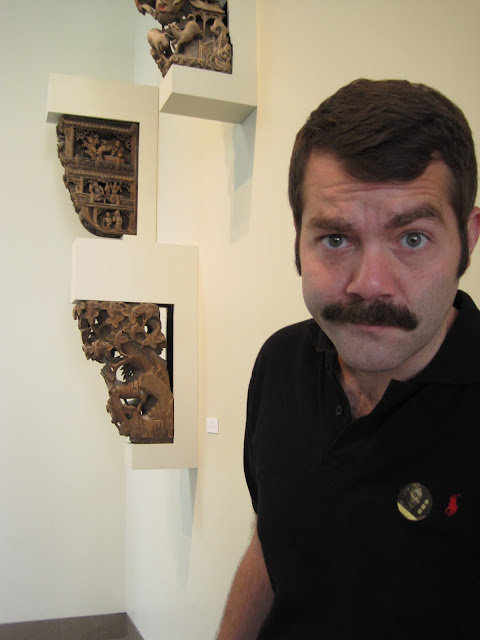 Totally unrelated to muffins, Ryan grew one heck of a 'stache and then shaved it off last week. I think he looked a lot like Ron Swanson.